St. Peter’s Basilica at the Vatican is often one of the first places people visit in Rome. But, there is not much of the man St. Peter visible in the building. Yes, there is 13th century bronze statue whose foot has been touched by so many pilgrims that it is worn away – but the statue is of a Peter we don’t really meet in scripture: seated in elegant clothing and teaching not only with authority but with calm and conviction. I don’t dislike this statue, but neither do I resonate with it. I was still looking for Peter in Rome. up, while Christianity was still illegal and punished, at the site of St. Peter’s execution. 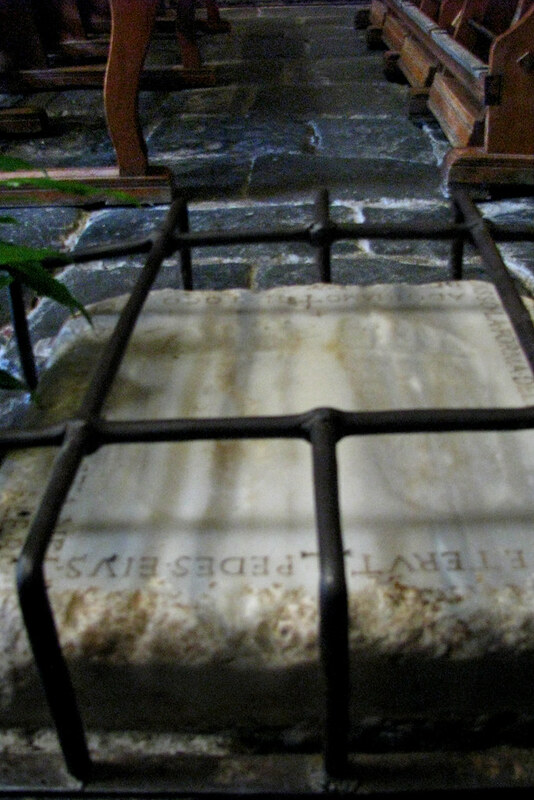 A combination of both excavation and careful reading of ancient documents has uncovered an unbroken tradition and, in fact, identified the spot where St. Peter’s earthly remains were placed at the time of his execution. Several layers below the floor of the current church, the spot can be seen from a few yards away. The journey to reach that location took me through tight passageways, walls whose style of construction reveals their age, and a growing sense of being far underground. While I didn’t really see Peter, the process of seeking is itself a mystery, and it is the mystery of the Church: how a few poorly organized and uneducated men could, from the day of Pentecost, increase their numbers so tremendously and found an institution which has adapted and survived for 2000 years. Part of the answer must be found in the spirit and soul of Peter, the leader of the first leader. To find the first glimpse of him hundreds of feet beneath the central structure of the Church is fitting. In the last two days, I have visited churches commemorating other, more dynamic aspects of Peter’s life and death in Rome. San Pietro in Vincoli contains the chains which held – and then loosed – Peter when he was imprisoned in Jerusalem, before he came to Rome. 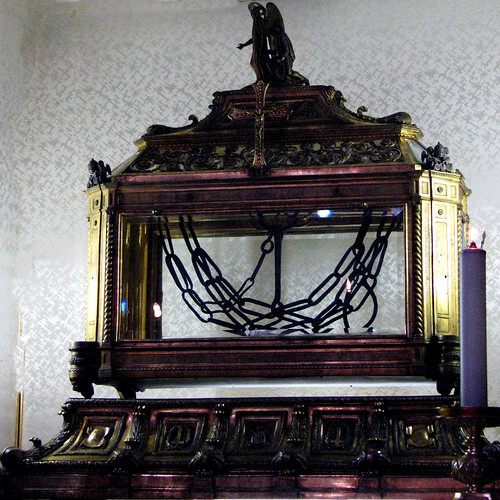 These chains, which were broken, were a foreshadowing but not yet the fullness of what he would experience that would lead him to understand to the depths of his being exactly who this Jesus was whom he had followed. Yesterday, I visited the teensy church of “Domine Quo Vadis” built over the spot on the Appian Way where Peter, fleeing the fires in Rome which were being blamed on Christians as the first of the big persecutions began, met Christ. He recognized Christ, and saw that he was on the road to go into Jerusalem. “Domine, quo vadis?” (Lord, where are you going?) he asked. Jesus’ answer, recorded in Latin: “Eo Romam iterum crucifigi” (I am going to Rome to be crucified again). A strip of the ancient Roman road runs directly through the church, with a marble replica of the stone with footprints (the original is in the Vatican) left as a sign for Peter. As the story goes – told well in the novel Quo Vadis by Polish author Henry Sienkiewicz which was made into a dreadful movie – this was not just another of Peter’s impetuous moments. It was the moment when he came to himself and was able to keep the pledge made years before, when he told Christ he would never deny him. We often think of the question “Quo vadis?” as though it were addressed to us: “Where are you going? What are you doing with your life?” But it was asked of Christ, by someone whose heart’s desire was to follow where Jesus went. It was in the act of following that Peter came to himself – the self that could not reach its fullness without surrendering to the Love and Word of God. The Peter whose burial place I glimpsed in the scavi beneath the large basilica is the Peter whom I met in that little church: the one who so loved Christ, and so knew himself to be loved, that he turned on the road, and followed Christ to death, with a message of love. I will visit St. Peter’s square and basilica once more before I leave. If I have a chance to touch the foot of the bronze statue, it will be with thoughts of that foot taking courage to turn and follow, no matter what the cost.